posted: June 06, 2015 by: jt Tags: "Clinic Specials" "News"
It is no secret that pets have teeth, and just as for ourselves, those teeth need attention. I'm willing to bet most everyone brushes their own teeth on a regular basis, along with flossing and dental visits for professional cleanings. In most cases though, our pets are not getting their teeth brushed daily. This increases the need for professional cleanings. Tartar is solidified bacteria, so leaving it on the teeth means that your pet is carrying around a petri dish of germs in their mouth. Gum recession, tooth decay, root abscesses and broken teeth are all commonly found in both dogs and cats during oral exams. At home treatments like dental treats, tooth brushing, water additives, etc can help slow down the tartar build up, but ultimately what is needed is a professional cleaning. For our pets this is done under anesthesia, with dental x rays taken and local nerve blocks performed in case of extractions. A thorough exam and bloodwork will be performed prior to the dental cleaning being scheduled and at this time the doctor can go over what will need to be done for your pet. In July we offer a 10% discount off dental cleanings, so consider making an appointment to see if this is something your pet needs. 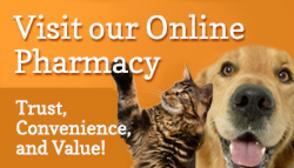 Clean teeth, fresh breath and a healthier pet await!